Dig the idea of "being away from it all," but not *too* away? Dig the idea of "being away from it all," but not *too* away? The new Inn Town Campground can deliver on both fronts. THE INN TOWN CAMPGROUND... to go one better on the glamping scene. 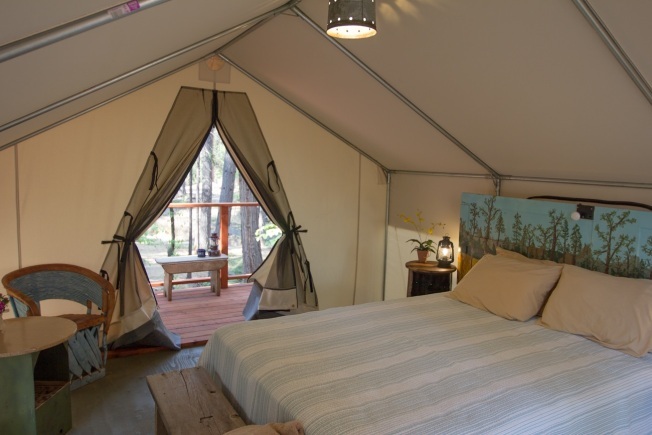 Not only does the new Nevada City destination, which debuted on July 1, have the touchstones of relaxed glamp-a-tude, including tents with bedside tables and electricity, but it is, wait for it, in town, so campers only need to stroll a little ways to find restaurants, bars, and shops. In short, you won't need to drive out into the woods to get a taste of a pastoral getaway. THE COMMONS, a sizable heated building at the heart of the campground, boasts a kitchen, a camp store, and a place to do your laundry, while the choices on where to bed down cover the pine-scented gamut, from places to pitch your own tent to glamp'd tents that are all set up and ready for you to plop down. RV hookups? They're there. A bathhouse with an indoor shower and flush toilets? Yep. Other gather spots, like a BBQ area? You can either find a place to hangout with other campers or stay cozy in your designated slice of campground. BY THE BY... if you know the town's funky Outside Inn, then you know the people who've created this bucolic bastion just a hop/skip away from Nevada City's Broad Street.